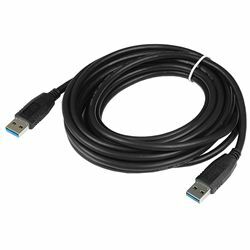 Connect USB 3.0 ("SuperSpeed") computers to certain hard drives, hubs and switch boxes with this 'A' male to 'A' male device cable. Designed specifically for the USB 3.0 plugs and sockets, it can carry 5 gigabits per second, ten times faster than USB 2.0. Please note, cannot be used with USB 2.0/1.1 devices.